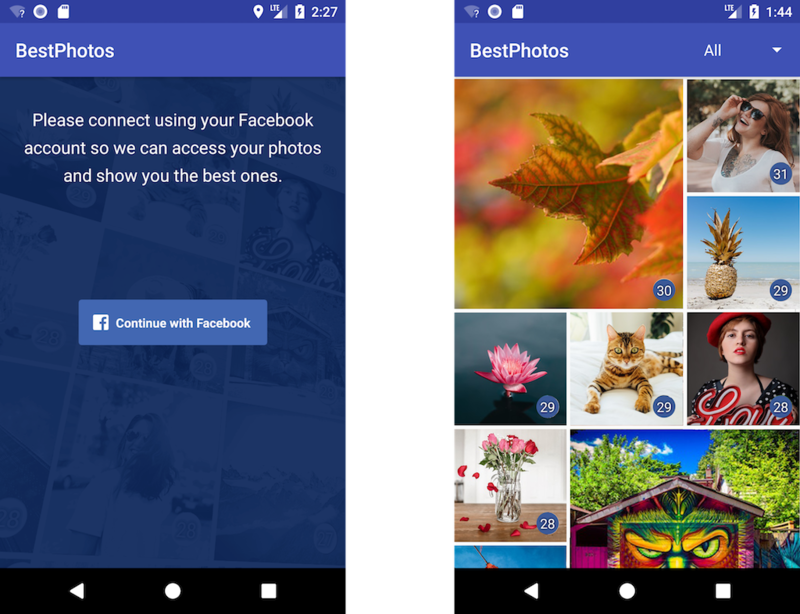 If you want to check it before you build it, you can download it from Google Play right now: BestPhotos – your most appreciated Facebook photos. Like before, we will create a new project using Android Studio. Let’s name it BestPhotos, choose the Phone and Tablet form factor and set the minimum SDK to API 16. Use a new Empty Activity named MainActivity as a starting point. The first thing we need to to in our app is to add Facebook Login. For this we need the Facebook SDK. You can find a guide on how to do this on Facebook’s developers website, but we’ll do it together in the following lines. First, you need to have a Facebook Application to be able to use the Facebook SDK. You can create one here, by selecting the My Apps menu from the top-right of the mage and then Add a New App. Give your new app a name and enter a contact email, then click on Create App ID. Copy the App ID from the top of the page, then go back to the Getting Started Android SDK page and click on the Quick Start for Android button. Now, click on the Sync Now link that should appear in Android Studio, on the top-right, to update the project with the new dependencies. Back to the Facebook’s Android Quick Start, fill in the package name and the default activity name. In my case those are com.dragosholban.bestphotos and com.dragosholban.bestphotos.MainActivity. You should use your own. Then click on the Next button. If your app is not available in Google Play, as is probably the case right now, just click on the Use this package name button from the warning Facebook gives you. You should now enter the development key hash, follow the instructions to generate it and add it to the Key Hashes field and click on Next one more time. That’s it. We’re now done adding Facebook SDK to our project and we are ready to add the Facebook Login functionality. If you run now the app, you should be asked by Facebook to allow your app to access the email and, if you allow it, you will see the Facebook token printed in the Logcat window. You should be aware that requesting this permission will need you to submit your app to Facebook for approval before you can make it public. 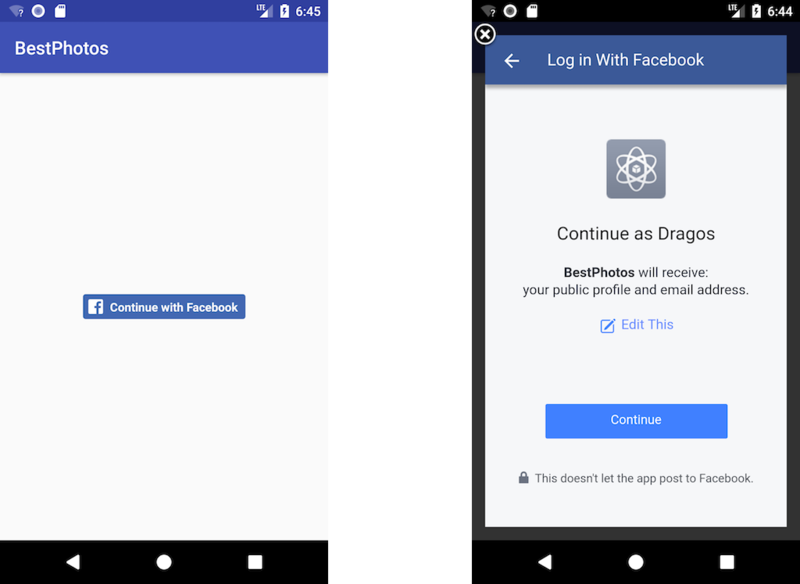 You can still use it with your own developer account or with your test users, but the general public will not be able to use it until approved by Facebook. You can find more details about this here. To show the photos we get from Facebook, we will need a new activity. So let’s create one named ImagesActivity, of type EmptyActivity. Run the app now to test that everything works fine and you still get the photos JSON in the Logcat window, but this time from the new ImagesActivity. Next, we need to create some “plain old java objects”, or POJO, that replicate the JSON structure. The Gson library will use them to parse the JSON string. You can use a tool like http://www.jsonschema2pojo.org/ to help you generate Java classes from JSON data. I used it for this example, but I changed the resulting code as you will see below. Here we iterated through all the images and logged the URLs, just to make sure everything works fine. Run the app and test for yourself. Here we just check if the fbPhotos object has paging with an after value and, if true, we run another the Graph API call using that value for the next 500 images. This will happen until we get all the images from Facebook. After this last change, we should have all the user’s images in our images array. Run the app to be sure everything still works before proceeding to the next part. 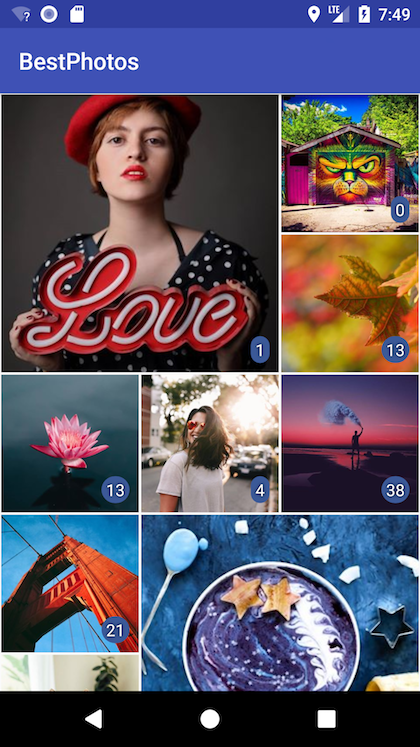 We also need two layouts for our images, one that holds a single, square image, and the other to be used when we need to display two vertical images. 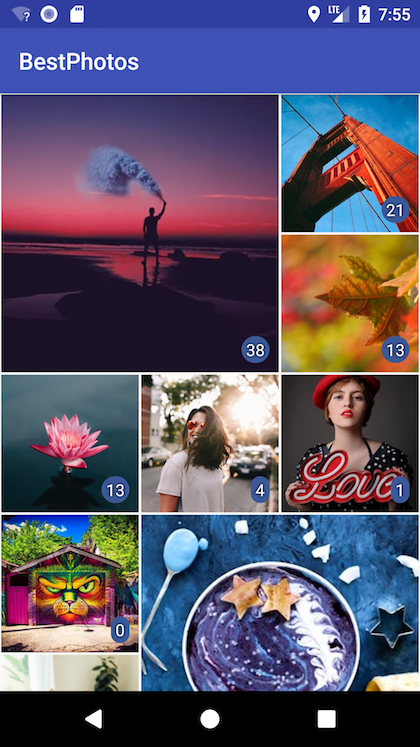 Run the app now and… after a few moments it should show you all the images you have uploaded to Facebook with their respective reactions count in the right-bottom corner. But… the images are not sorted. So let’s do that next. Run the app now and check. All the images should be sorted so you first see your best Facebook images ever posted. What if you add more images and you want to see them in the list? We could use some kind of mechanism to refresh our list, so let’s implement the swipe to refresh gesture. It’s nice that we can see our best photos posted on Facebook, but it will be greater to see those who performed best each year. So let’s add a filter so we can find out this. That’s it. 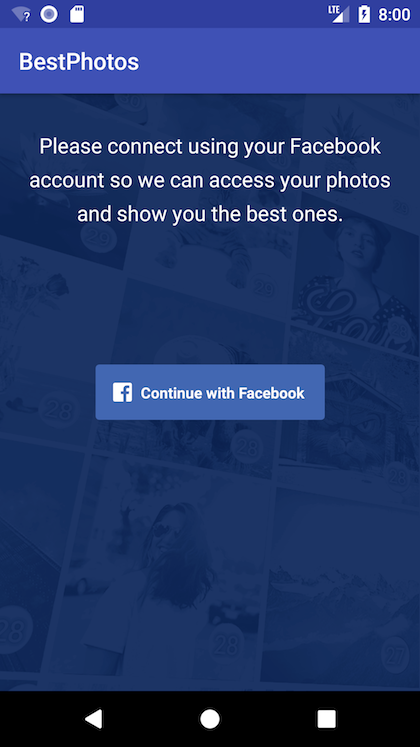 Try the app now and find out what were your best photos posted on Facebook each year. android:text="Please connect using your Facebook account so we can access your photos and show you the best ones." You can download the background images used from here. In the res folder, create new drawable directories for each screen density (drawable-ldpi, drawable-mdpi, drawable-hdpi, drawable-xhdpi, drawable-xxhdpi and drawable-xxxhdpi) and add the corresponding images. That should be all. Run the app one more time and check if everything works as it should.